We continue to work on the deck preparing it for paint and canvas, but in the meantime we are receiving more and more of our bits and pieces. 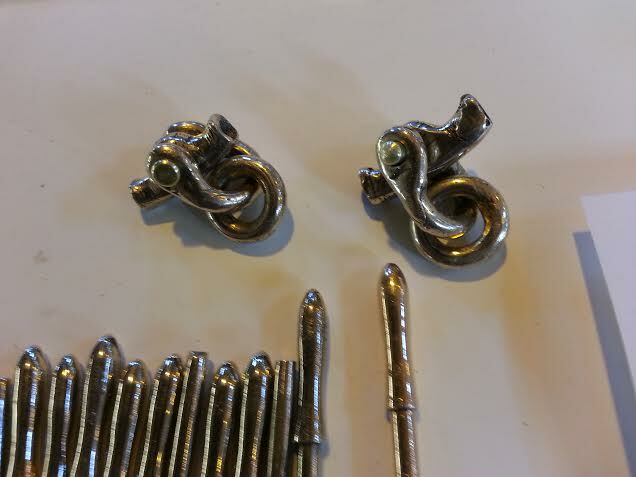 These are really small jewel-like masterpieces from Mike Mirman which we’ll finish up with buffing and polishing. The first picture is the mainsail clue outhaul slide. In real life it fits onto a 6 foot long heavy duty sail track at the tip of the boom. Inserted in the top is a fitting sewn into the clue of the sail and then pinned to the slide. You can see its size compared to a penny in our scale. 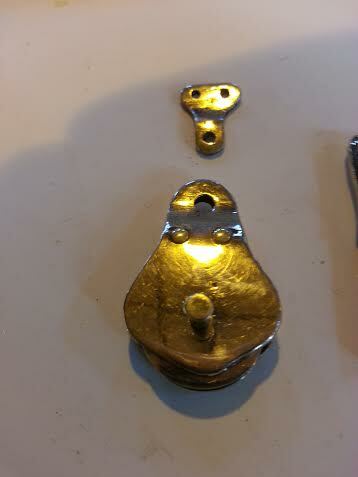 The second picture shows the mainsail outhaul sheave holder which is to be attached at the very tip of the boom. 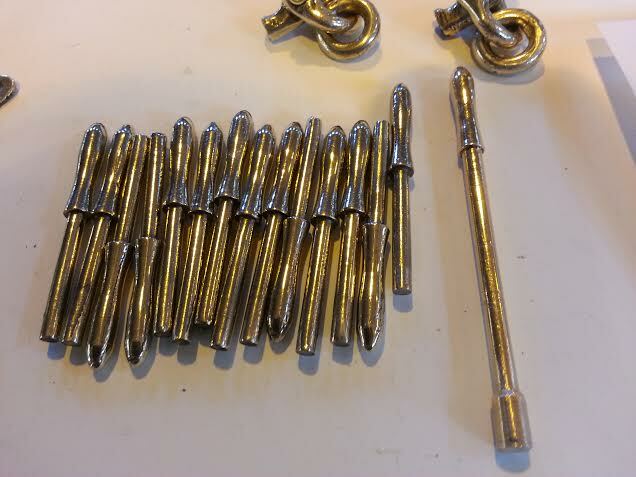 The third picture is of our the belaying pins – about two inches long. The longer ones will be threaded and be used for the forward and aft legs of the pinrail which fellow RELIANCE teammate Steve Siok is making. 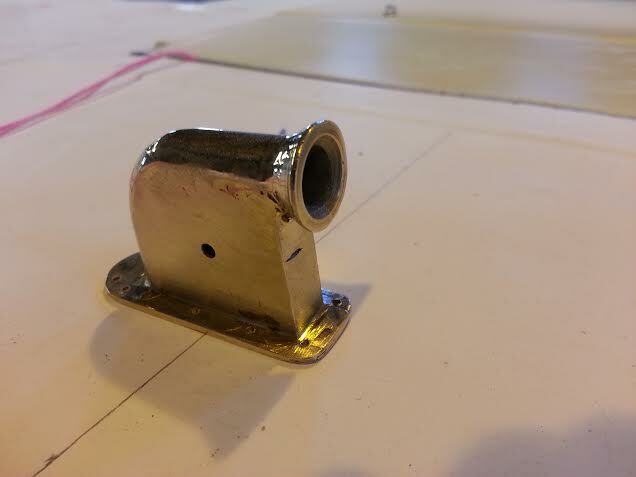 MIke has also made a port and starboard mainsheet sheave holder, the fourth picture. It also is about 2 inches long. It sits amidships. The mainsheet comes from aft to here, through the bellow and around an internal sheave to drums and winches below deck. He’s taken them back to his shop to attach brake levers and add the internal sheaves. 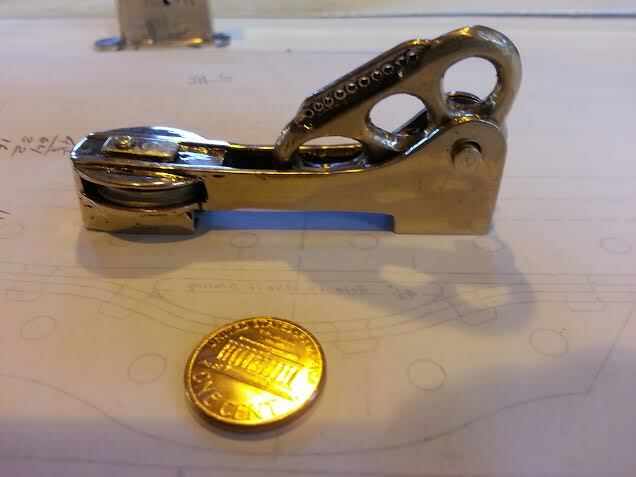 We also received two mainsheet span shackle assemblies from Mike. The whole assembly is about the size of a silver dollar! Upon close inspection you a see that the shackles are actually twisted. 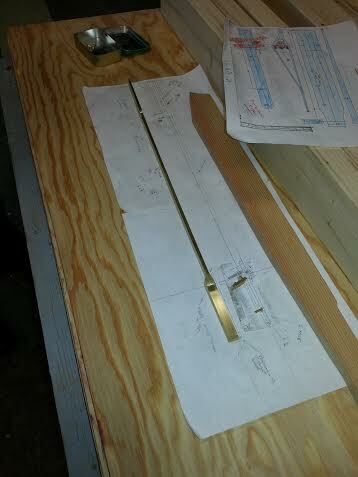 Meanwhile Joe Uzzo continues to work on his hatches and companionway. Here you see the barometer, race card and clock sitting on a ledge in the companionway. If you really look, you’ll see actual barometer and clock faces complete in all detail. 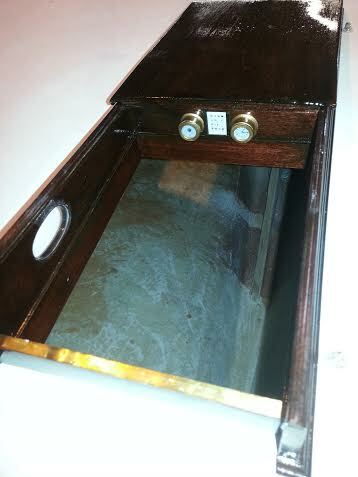 The second picture shows the companionway and its ladder. We also have a new RELIANCE team member Burr Sebring who brings a wealth of metalworking skill, having retired from Gorham – the silverware company . In this last photo you can see his work-in-progress on the metal strut that forms the back edge of the douglas fir mainmast spreader. 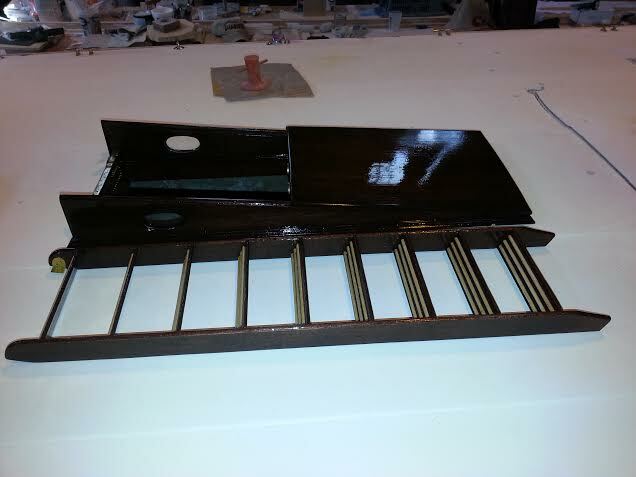 The little insert that will carry two shrouds to the top of the mast has been completed. Same piece count in 1/6th scale as the original! This entry was posted in Project Manager's Welcome and tagged Burr Sebring, Joe Uzzo, mainsail, Mike Mirman, RELIANCE, Steve Siok on March 11, 2014 by Herreshoff Marine Museum/America's Cup Hall of Fame.